“Ernest, you pushed me down the stairs!” It’s been twenty four years since we heard Meryl Streep utter those words with a twisted neck, and still, Death Becomes Her remains a cult classic among millennials. Like most 90s films, we’ve re-discovered its zest by celebrating it on the internet in forums and gifs. Why is that? 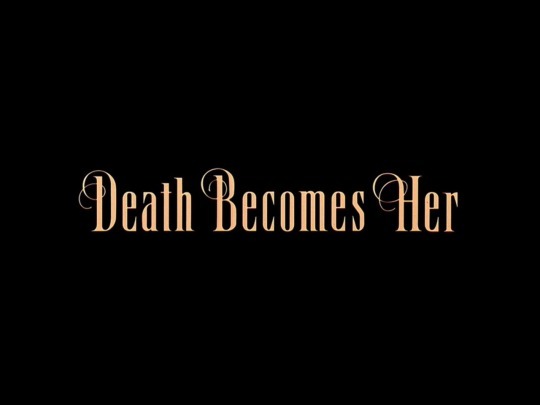 What Death Becomes Her such a staple? Well, aside from its dark comedy, the film is a constant reminder of the dangers of self-absorption. Never has that conflict been more relatable until our current ‘Selfie Age’. 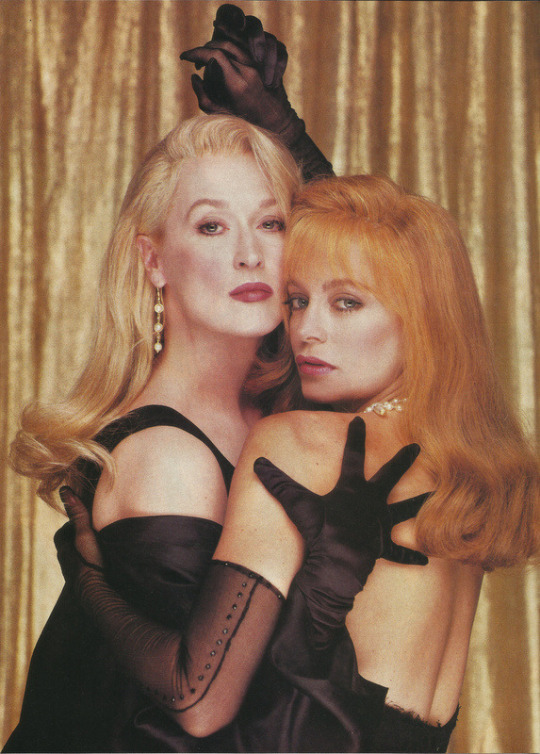 Death Becomes Her holds nostalgia for many of us, but lets re-visit the basic details, synopsis and character of the film to evaluate its witty, clever and dark message. The films picks up in 1978, where a young Madeline Ashton, played by Meryl Streep is starring in a Broadway Musical play, Songbird, based on the Tennessee Williams’ Sweet Bird of Youth. Everyone in the audience isn’t feeling it, everyone except a frumpy male with a glowering date. Enter Ernest Menville (Bruce Willis) and Helen Sharp (Goldie Hawn). Helen is an old schoolmate of Madeline’s. She has a history of losing her lovers to the shine of her beautiful blonde friend, so she decides to put her fiance, Ernest to the test by bringing him to the show. He’s failing badly, and this becomes more apparent once the couple goes back stage. Superficial Madeline becomes interested with Ernest because he is a world renowned plastic surgeon. And what actress doesn’t worry about losing their looks? Cut to the next scene and lo and behold, Madeline and Ernest are getting married while poor Helen is fuming in the church. Fast forward to over a decade later and Ernest despises his wife for her loss of humanity. He sees her for who she truly is now, vain, selfish, and really belittling. He drinks to cope with his depression and loveless marriage, and also his now dead career, which consists of painting faces of the deceased to make them look less sallow and lifeless. Helen Sharp leaves therapy/rehab and becomes a successful author as well. She also has gotten a hold of herself and her shape back. Here’s where things begin to get fun. Helen finds Ernest and seduces him back into her arms. She devises a plan to knock off Madeline, but in a moment of fury, Ernest fails those plans by assuming his assertion and pushing Madeline down the stairs. But oh, she doesn’t die! She lives–and with a cracked neck! And so, the battle and persevering displays of vanity bleed–with the reveal of Madeline and Helen’s fountain of youth, their gruesome brawls, their inevitable bonding over their vanity and pursuit to keep Ernest alive–as he’s experienced with the cosmetics of the dead. It’s a damn good time–a cinematic treat that was ahead of its time with special effects, full of melodramatic and grand musical scores and color pallete and eerieness only Tim Burton can rival. Not to mention the depth of characters and script. There’s some one liners in that have transcended time. There’s no magic potion to prevent us from dying. And there damn sure isn’t a remedy to stop us from aging, but there are things to turn the clock back temporarily, and they’re the same things Madeline and Helen grew tired of, plastic surgery. They weren’t tired of having more things done. In fact, they craved more things surgery after surgery. They wanted youth and became insatiable until they absolutely broke apart. However, youth isn’t something you can bottle. Americans are more addicted to plastic surgery than ever before. It’s estimated that since the year 2000, the amount of money our country has spent on botox procedures has increased to 748%. Both men and women are filling up schedules to nip, tuck, remove and add. Males even made up 13% of 2014’s plastic surgery $2.4 billion return. Most of this is attributed to the fact that, if you get one procedure, you are prone to more–just like Madeline and Helen. the likelihood of your return to the knife or needle goes up 50% after your first procedure. That’s a huge number! Overall, the outside of your body reflects what’s on the inside. It comes down to health, diet, exercise, sleep cycles, stress levels and genetics. Each of us walks around with different DNA strands and cells. So, what works for some, may not work for you. Be sure to take the time to find the customized routine which fuels your body. For example, Chrisette Michelle and actress Kathleen Turner feel their best on a paleo diet without processed foods. Our girl Vashtie–who looks of the same age she was when I first saw her ten years ago–adopts a vegan and holistic lifestyle to keep herself in tip top shape. Same for Christie Brinkley, who is 60 years old and killing it. Pharrell Williams–who swears he isn’t a vampire– says his youthful looks are due to the Atkins’ diet, exercise, washing his face and moisturizing like mad and saying no alcohol. You’re only as young as you feel. So make sure you treat your insides just as good as your outsides for optimal results. And lastly, while a little help from the miracles of plastic surgery isn’t anything to be ashamed of, remember, beauty is only skin deep. The way you are sculpted is secondary to the soul you contain.